Protestors at the Republican National Convention in Cleveland. 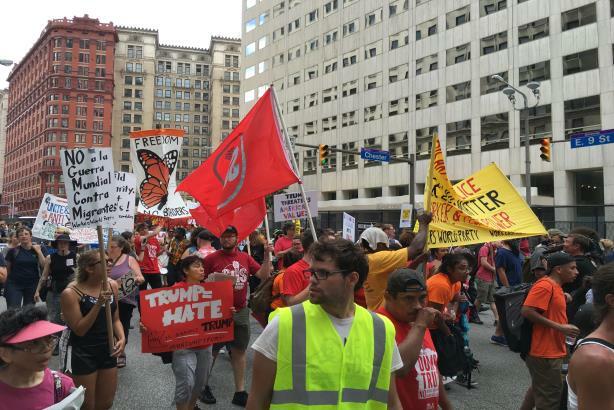 We’re in the middle of political convention season and one particularly interesting element is the organized protests at both conventions. Although they can be simplistically viewed as exercises in free speech, in academic terms they are pseudo-events, an event staged for the purpose of generating attention. Pseudo-events aren’t as simple as they appear at first glance. Daniel Boorstin introduced the term and described its parameters in 1961 in his book The image: A guide to pseudo-events in America, yet it has been a long-standing and valuable tool of PR. A pseudo-event is a controlled and planned event that seeks to use PR to gain favorable media coverage and public attention. I use the word "controlled" because we are all familiar with occurrences that are spontaneous or out of our control. An out of control incident is usually an accident, a crisis, or sometimes negative media coverage. Events differ because they happen whether or not media coverage ensues. Pseudo-events are carefully controlled and use the media as a tool to accomplish strategic goals, often attitude change resulting in public support, and perhaps legislative support. Pseudo-events are often linked to activist causes and commonly used by activist groups to advance awareness of their stances, as a recruiting tool, to seek public support, and to pressure lawmakers to act on behalf of their cause. A true pseudo-event is not spontaneous but normally comes about through careful planning or stimulating an action one wishes the media to report. It could be as simple as a press conference with some announcement (stimulated using social media) but its more common use is as a planned special event. One example of a pseudo-event from history would be Cleopatra's entry into Rome around 46 B.C. Her entry was planned to the last detail to generate support as an ally among the Roman people and the emperor Julius Caesar. Cleopatra’s procession offered a dazzling display of entertainment from athletic prowess to exotic animals, and she provided gifts of fruit and flowers to the awaiting crowd. The pseudo-event was so lavish and extravagant it is still talked about today, which is effective PR in anyone's book. The political conventions offer numerous examples of planned pseudo-events and PR pros should watch carefully. Those protests that become fractious may do so on purpose as part of the generation of media coverage as a strategic goal. We can all learn from what we will see over these two weeks in our contentious society, and the ethics of these actions also need to be considered. As a result of all the attention that will no doubt be generated, you may soon face questions about if, when, and how a pseudo-event should be used. And pseudo-events don’t only pertain to the political or legislative realm. For example, if your company has just finished construction of a new manufacturing site or distribution center, should you hold an open house? An open house is a great way to gain publicity, crystallize local opinion about your company, and visualize the positive effect on jobs it will have. This can be a positive pseudo-event but you also have to protect your facilities, proprietary information, or patented process. And you should probably anticipate protesters outside the event or even trying to block access to it. Is the media coverage generated worth it? Perhaps more ethically challenging, should you invite community protesters who boycotted the expansion? These are not small questions that management will need to explore and the PR adviser should be able to answer them. Even though a pseudo-event is controlled and carefully planned, one cannot control the media coverage that results and it can become negative. As an example, think of Chipotle Mexican Grill and its recent crisis with E. coli food poisoning. This has been a PR disaster for the chain, resulting in FDA and CDC investigations into the outbreaks. Despite early press conferences on store closings in the Pacific Northwest and reassurances of safety, E. coli persisted and media coverage became negative. Chipotle lost customers, its stock price fell dramatically, and its reputation was all but destroyed. Chipotle management was too slow to respond and lost control of its message. Eventually Chipotle reacted by doing many of the right things: closing affected restaurants, confirming no employees were infected, expanded testing of fresh product, and deep cleaning all closed restaurants. But was it too little, too late? If you were the PR consultant to Chipotle, perhaps it would have been advantageous to stage a pseudo-event to regain lost customers and reputation. How about open house visits to supplier facilities, offering media an up-close tour of redesigned quality control testing? As you can see, pseudo-events can be exceptionally effective ways of disseminating a message. Pseudo-events can extend far beyond the political realm that is being highlighted in the next few weeks and months, but watching them closely can help us discern the strategy behind such activities. Although we have a vast array of methods to communicate to stakeholders, publics, and the media, we should consider the pseudo-event as an exceptionally effective and valuable tool in our strategic plans. Shannon Bowen researches and teaches PR ethics at the University of South Carolina. She is a member of the board of trustees of the Arthur W. Page Society and board of directors at the International Public Relations Research Conference. Her column focuses on PR education, ethics, and the C-suite. She can be reached at sbowen@sc.edu.